It's reveal time! I can't believe just how long it's been since I've played along in the Art Jewelry Elements Component of the Month Challenges…it's so good to be back at it! Sorry I'm so late—I was still finishing my design late last night and… then had to wait on daylight and to get enough time to edit photos and write up my post today. Anyhoo… here I am at last! 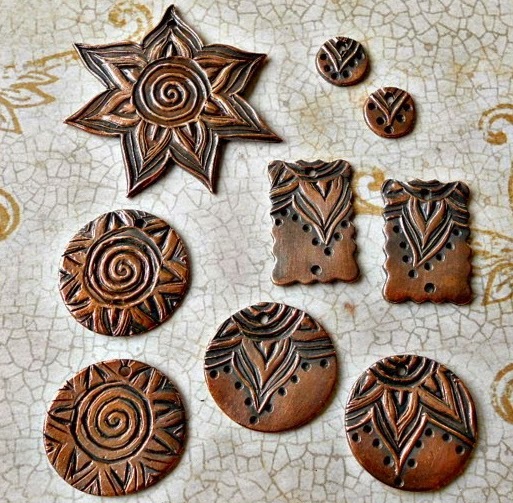 For this month's challenge it was Melissa Meman's turn to be our hostess and component maker… she started by carving her own original design stamp and then shaped a beautiful assortment of components in copper clay. It's not often that I use copper in my designs, but a chance to try a brand new component is not something an art bead lover can pass up easily! I snatched up a pair of her stamped rectangle charms right away! It was so hard to settle on one design idea… I went from my original plan to make earrings… to a bracelet… to finally a necklace! A necklace that is now one of my very favorites ever. I love the dark lines of Melissa's design and the soft glow of the copper and really wanted to keep it the focal point of my design without any overly distracting colors or patterns, so I chose to go very neutral. And I think I was maybe just a little inspired by all the snow that has fallen this winter—way too much if you ask me, but it's been lovely to look at! I've titled my necklace "Winter Rose". The palette reminds me of the melting snow, as the faded leaves of the forest floor start to peek through. It's beautiful out—colors of winter are so saturated with the wetness of the melting snow and it's one of the very best times to go walking… if you don't mind the cold! I used Melissa's copper charms to frame one of my own hand-painted polymer roses—like little leaves on either side. I chose some rectangular white agate to echo the shape of Melissa's charms. Almost all of these beads came from a recent bead swap with a wonderfully generous bead lover I met through Etsy. And what fun new beads I got! She'd had the stash of beads for quite some time, so I'm not absolutely sure what they all are—czech glass for the rondelles and the creamy-white ones look like some kind of stone, maybe. Doesn't really matter to me—I just love how they all fit into my design so nicely! My sister Bethanne was sorting the bead swap with me (I think she may have kept some for herself! ;-) and suggested I add a pop of color with the oxblood red faceted rounds. Yes! Of course—one of my very favorites! I also threw in a sprinkling of oxblood seed beads to match. I didn't have enough of the same beads to go all the around the necklace and didn't want to add anything else to the design. So it took me practically forever to decide how to finish the back of the necklace, but in the end I went with the simplicity of hemp cord. I made beaded loops at the end of the beaded section and knotted the hemp cord to that—I like that it adds a bit more texture and rustic-ness to my design and that I can easily adjust the length. And there you have it—my brand new favorite necklace! Thank you Melissa, for another most gorgeous and inspiring CoM! And thank you to all you readers for stopping by to visit! Hello again… and a sale for you! Hello again dear readers! I hope you'll forgive my blog silence—my creative life has been a whirlwind of happenings since about October of last year. And then some happy family time around the holidays and of course some unexpected things that always seem to show up when life is busy enough already… and somehow in the middle of all that blogging never got crossed off my list. So, what's happening at Tree Wings Studio these days? Right now it's all about catching up after the holidays and getting a little ahead to allow for new beadmaking. So, I'm casting and shaping, casting and shaping… and then painting for a few days before I go back to casting and shaping some more. I love seeing that mound of critters on my table grow larger every day! If you also follow AJE blog, you've already heard a bit of my leather journey. Recently all my studio time that isn't spent on beadmaking has been spent leather shopping. I have big plans for my leather designs and a reliable supplier is a must! It's been an exhausting and sometimes frustrating journey, but I've learned so much and am nearly at the point where I can get back to making my leather designs! My coffee mugs have been kept very full during my studio hours. On these cold winter days a hot cup of coffee is a VERY good thing! The cold outdoors (low teens and single digits with snow on its way!) has kept me inside as much as possible, but even though it's sometimes very grey and bleak, I love the view, and the little creatures that pause to visit outside my studio window. And there's something so lovely about the bare trees against the cloudy grey skies. During the leafy spring and summer months it's easy to forget how majestic they truly are. You know me—I love watching them blow in the wind this time of year! My furry studio companion has just turned 2 years old. Well, I'm really not sure of his true age, but dear little Grapenut has been my friend for 2 years now—he's been from feral to best buddy—he showed up just when I needed him most and I so cherish our friendship! Speaking of furry friends—my two favorite horse friends are looking quite handsome… and glamorous! in their brand new outfits. Getting the right size and fit was an adventure all it's own and a story I'll have to tell another day, but they certainly are pleased (me too!) that they have warm blankets just in time for this very chilly weather! So, now you've heard a bit of my latest happenings… and I want to say thank you for stopping by! It's good to be blogging again! so it's time for a sale for you! 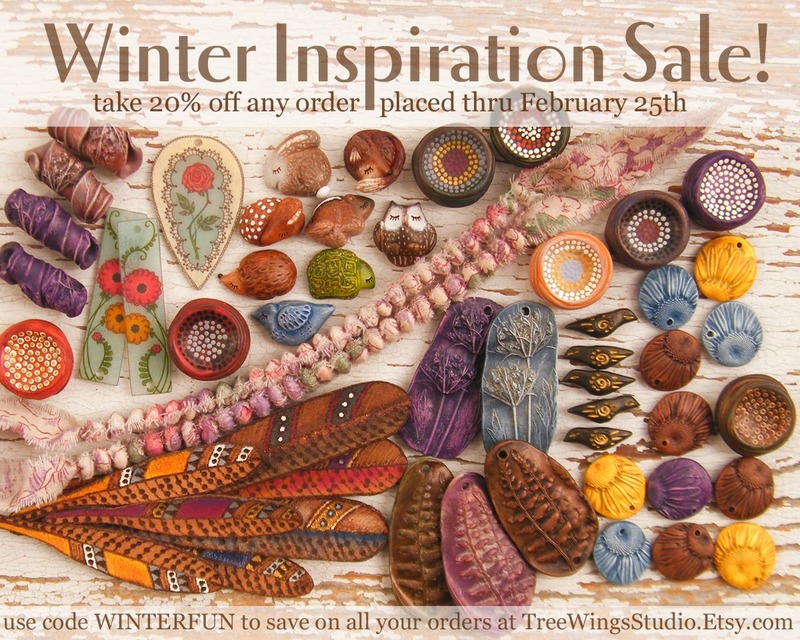 Take 20% off any order placed in my shop starting today—thru Wednesday, February 25th! Use code WINTERFUN at checkout. And… I almost forgot! Today I'm posting again on AJE blog—be sure to peek in on all our latest news and see my brand new daisy earring tutorial. Happy shopping! And Happy Monday to you all!